HOW TO CHOOSE CYCLING TOPS. - Terry Peloton. You are here: Home / Sidesaddle Blog / Cycling Savvy / HOW TO CHOOSE CYCLING TOPS. HOW TO CHOOSE CYCLING TOPS. 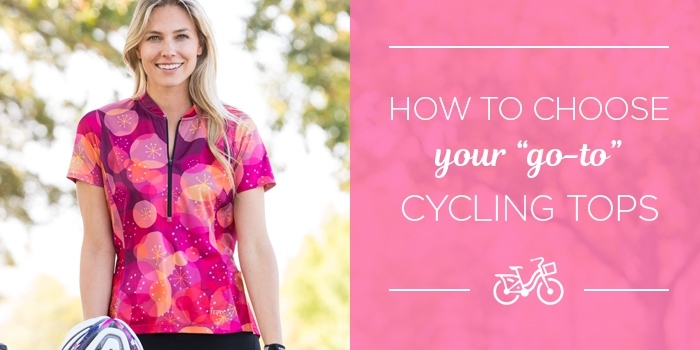 There’s so much more to choosing cycling tops – or bike jerseys – than just finding patterns and colors you like. Finding the right tops for your riding style, comfort preferences and performance needs will make all your rides more fun and enjoyable. Striking the right balance between warmth, ventilation, and sun protection is your first consideration. It’s the biggest reason why most cyclists collect a variety of cycling tops – to make sure they have just the right jersey for any weather conditions they expect to ride in. Don’t forget about the cycling bolero – a very useful addition to your cycling wardrobe. Wear over short sleeve cycling tops for extra protection against sun or cold air, then stow it easily when conditions change. Athletic Form-fitted for best moisture wicking and aerodynamics to minimize wind resistance and flapping. Typically these are considered “performance” tops and are well suited for intensive riding. See athletic fit options here. Semi-Fitted Body contoured, but not tight, this fit splits the difference between athletic and relaxed fit tops. Suited for touring and fitness/recreational riding where aerodynamics are less important than all-day, on/off bike comfort. Browse semi-fitted cycling top options here. Relaxed Loose against the body. Unusual to find in the cycling industry, we offer several tops in this fit category for riders who simply don’t want to wear anything tight but do want the features of a technical top. Shop relaxed fit tops here. So which fabrics are best for cycling tops? The world has exploded with technical man-made fabric options, all-natural performance alternatives, sustainable fibers like bamboo and a host of yarns, treatments and finishes that can add certain characteristics. All of these have something to offer. Look for fabrics that have good technical properties like the ones listed below. CoolMax®: An engineered fabric that transports more moisture than other fabrics, whether they’re natural or synthetic. Because of its unique fiber construction, CoolMax® moves perspiration quickly to the outside of your bicycle jersey where it evaporates. Thus it keeps you cool and dry supporting optimum performance throughout your ride. Find bike clothing using CoolMax here. MYNX® UV: Clothes made with MYNX® UV provide cyclists with sun protection against UVA (aging) and UVB (burning) rays. MYNX® UV offers permanent sun protection up to 50+ UPF rating, depending upon fabric construction and color and maintains a 100% UPF rating in wet and dry fabrics. Mnyx® UV provides fabric with a soft, cool hand and subdued luster and is perfect for lightweight fabrics. Check out some options using MYNX protection here. Merino Wool: Where wool is considered one of nature’s miracle fabrics, merino is the crème de la crème for cycling. Finest and softest wool of any sheep, Merino makes a great next-to-skin natural fabric alternative for cyclists. It excels at regulating body temperature, providing a high degree of warmth to weight so you don’t have to bulk up. It is also excellent for moisture wicking, is slightly moisture repellent, has lanolin for antibacterial properties and can be aired out rather than washed with each use. Browse jerseys and more in merino here. Ready to explore? See all our bike tops here. Or start with short sleeve tops, sleeveless tops, or long sleeve tops.